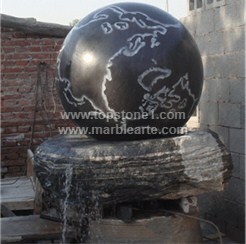 Description: monthly_special_7 - The monthly special 7 offers you sphere fountains with a natural rock base. This is a water fountain type that is perfect as fountains indoors or outdoors. With its natural stone cut and marble ball design, the kugelbrunnen- inspired creation is an intricate addition to the world of modern water features. As outdoor water fountains, these make your garden fountain look ordinary in comparison. As water fountains indoor it can replace any potted plant or bedecked glass surface to be the centerpiece for both a business as well as a homey environment. With these as backyard fountains, the whole ambience can be altered to soothe and caress the senses.